The choice of woods has an important role in determining the final outcome and sound of a guitar. The selection of species, cut, drying and age of the wood all aid in the formation of the final instrument. Most of the woods used in Walter guitars are personally processed from large pieces, called billets or "cants" in order to work from a fuller portion of the once living tree. This is the best way to optimize the scarce resources while using the finest parts of the timbers for the most critical needs. Also, since wood is such a variable material, using wood from the same tree in multiple instruments provides a consistency to the builder that is not available with wood purchased in sets from tonewood dealers. Wood used in Walter guitars have been in the shop for at least ten years, and some of the most critical parts has been drying and seasoning for 20 years or more.. Sadly, the supply of the best woods used for guitar building has been greatly depleted from the world's forests. While some traditional woods are still available, other less well known species are providing excellent alternatives, both acoustically and visually. Most guitar soundboards are made from either spruce, western red cedar or redwood. Soundboards must be well aged and perfectly quartersawn to achieve the stability required for such a thin piece of wood under such high tension. Soundboards in the Walter shop spend at least 10-20 years drying and seasoning in different conditions to make sure this most important piece of wood achieves its maximum potential. When considering which wood to choose for a guitar, realize that describing sound is a very difficult thing to do, and that one player’s adjective might have the opposite meaning in another player’s opinion. Words like “dark,” “bright,” and ”warm” should be used sparingly. Instead think about (and research!) “fundamental,” “overtones,” and “focus” to bring a more clinical definition to a sound while still keeping the more personal and romantic descriptions borrowed from color and light. Keep in mind that wood does not behave the same in each guitar maker’s hands. One maker’s cedar guitars, for example, might sound “dark and Spanish” in character with a strong low overtone partials, while another maker’s cedar might be “brighter” with stronger upper overtone partials. Also remember that nothing beats hearing a particular guitarmaker’s instruments to get an idea of how each wood responds in that maker’s hands. Walter tries to keep at least one cedar and one spruce guitar on hand so visitors can get a sense of how the different woods sound. The main types of spruce used in fine classical guitars are European, Englemann and Sitka. 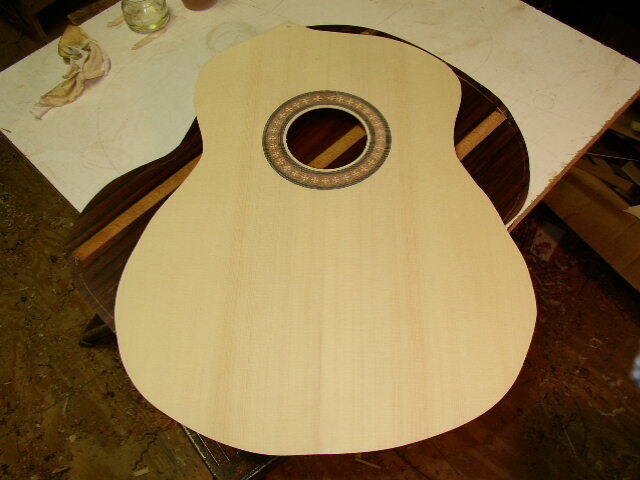 Spruce starts its life as a guitar near white and darkens over time to a rich honey light brown. Walter’s stock of European spruce comes from the German and Austrian Alps, harvested during the new moon phase in February, a time when the tonewood harvesters feel the sap levels are at their lowest. This condition gives the wood its best structural characteristics for great instruments. European spruce has the longest break-in period, taking up to 5 years to reach its potential in sound but many guitarists feel the wait is worthwhile, as it imparts a very focused sound and wide color palette. Englemann spruce comes from the North American Rockies, and most of Walter’s supply comes from standing dead trees in Canada. Englemann spruce imparts a well-focused sound with a broad color palette, and is more open that European spruce from the start. It still matures well, and some of Walter’s finest spruce guitars are made from Englemann. This wood, while once plentiful, has become more rare and expensive. Sitka spruce is rarely used in classical guitars because of its higher density but it is the preferred spruce for steel string instruments. Western red cedar has only been in use as a tonewood for about 50 years. It is tan to brown in color with occasional streaking that does not influence its acoustical properties. Grown in the Pacific Northwest, it has come under a lot of pressure from logging and many of the old growth forests are restricted from further harvesting. Much of the cedar (and redwood) available today is “sinker” wood – logs that sank to the bottom of logging mill rivers. Because of the prohibitions against old growth log harvesting these logs are now highly coveted. Cedar typically imparts less fundamental and more upper overtone partials to the sound, making a sound that is often referred to as “warm.” Redwood (sequoia sempervirons – not sequoia gigantea, the giant redwoods) is often compared to cedar, but with more spruce-like characteristics. The visual color of redwood is usually darker and redder than cedar, and the best quality wood is very stiff and light. The function of the back and sides of a guitar is more than structural. 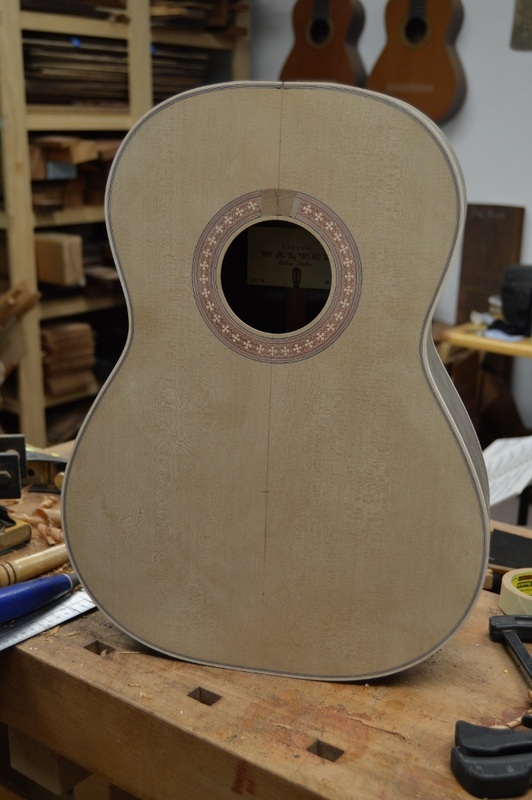 When properly crafted the back imparts its own sound to the guitar that can help encourage either high or low overtones depending on the species and its thickness. Brazilian rosewood has been the gold standard for guitar backs and sides for over a hundred years, but severe overharvesting has resulted in the wood’s placement on the CITES (Control of International Trade in Endangered Species) list. Since its placement on the list in 1991, only wood that has been in the United States since that time can be bought or sold commercially. Paperwork from US Fish and Wildlife offices that regulates trade in endangered species can be available for wood recently purchased but there is no guarantee that that paperwork will apply to a guitar made from that material. Having one’s guitar confiscated at a border crossing in addition to heavy fines may be the cost of having a guitar made from this wood. Currently Walter discourages its use because of its great expense and high risk. Indian rosewood has been the accepted substitute for Brazilian for many years and is currently the standard wood for many guitar makers. Indian rosewood can be variable in density so it is important to consider each piece of wood when pairing with a particular soundboard. Indian rosewood tends to be dark brown and purple, with very straight grain. Other woods used for backs and sides include Amazon rosewood, Padauk, Honduras rosewood, Macassar ebony, Asian ebony (also known as Malaysian blackwood), Bubinga, Koa, Imbuia , Kiatt and many more. See the Gallery page for visual examples, and contact Steve to discuss how these woods sound in combination with the soundboard wood of your choice. Woods used for the neck of the guitar can affect the sound as well. Typically either Honduras mahogany or Spanish cedar are used for classical guitar necks. Mahogany is heavier and denser, which can enhance the sustain of a guitar. Spanish cedar is lighter and tends to emphasize the attack of the sound. Both are similar in color, however, Walter has recently received a large stock of 35 year old mahogany that has aged to be considerably darker than wood more recently harvested. Fingerboards are almost exclusively made from ebony for its extreme durability, although which particular species depends on availability and quality. Walter uses both Macassar ebony and African ebony.